Looking for a special appetizer to bring to your next gathering? Or want to serve your kids a healthy but fun snack? Try one of these innovative twists on salsa. This chunky recipe—which was the first place winner in the Special Variety category at the 2008 Austin Chronicle Hot Sauce Festival—calls for a combination of mango, bell peppers, tomatoes, garlic, onion and chile peppers. The sweet mango flavor balances the spicy peppers. Find the recipe here. It only takes two minutes to prepare this very simple, mild recipe. Puree chopped tomatoes, chopped cilantro, red onion and lime juice, then add salt to taste. It’s healthy, and your kids will love it. For a chunkier version, skip the food processor. Get the recipe here. If you love salsa but don’t want to go overboard with the tortilla chips, try serving it with cucumber “chips” instead. 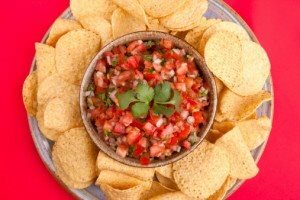 This tomato salsa recipe is nearly fat-free and easy to make—just toss chopped tomatoes with sweet onion, cilantro, minced jalapeno and fresh lime juice. Get the recipe here. This recipe—which includes pineapple, pineapple juice, jicama, cilantro, brown sugar, jalapeno, scallions, red onions and lime juice—is both sweet and tart. It’s low in calories, takes just 20 minutes to make, and tastes delicious with pork tenderloin. Here’s the recipe. Ideal for a snack, this sweet recipe involves combining finely chopped strawberries with chopped avocado, fresh cilantro, jalapeno pepper and fresh lime juice. You sprinkle sugar and cinnamon over oil-coated tortilla chips and bake for 10 minutes. The recipe only takes 20 minutes to prepare and serves 12. Get the recipe here.